Johnson & Johnson has been sued thousands of times over the past few years over its marketing of talcum powder. Many women have claimed the company knew of a link between ovarian cancer and talc use for decades. Asbestos-related lawsuits are the most recent challenge for the pharmaceutical giant. The latest lawsuit to hit the company was filed by a man, Stephen Lanzo, who alleged that he developed mesothelioma after inhaling dust that was generated through his regular use of Johnson & Johnson talc powder products since his birth in 1972 to approximately 2003. On Thursday, a New Jersey state court jury ordered Johnson & Johnson and Imerys SA to pay at least $37 million in damages in the case. The jury awarded Lanzo $30 million and his wife $7 million after finding Johnson & Johnson responsible for 70 percent of the damages and Imerys (the company’s talc supplier) responsible for 30 percent. The second phase of the trial is set to begin next week. On Tuesday, the jurors will decide whether to award punitive damages. Johnson & Johnson said it was disappointed by the jury’s most recent decision. “While we are disappointed with this decision, the jury has further deliberations to conduct in this trial and we will reserve additional comment until the case is fully completed,” Carol Goodrich, a spokeswoman for Johnson & Johnson, said in a statement. Johnson & Johnson maintains that its products are not carcinogenic and have never contained traces of asbestos fibers. “Since the 1970s, talc used in consumer products has been required to be asbestos-free, so JOHNSON’S talc products do not contain asbestos, a substance classified as cancer-causing. 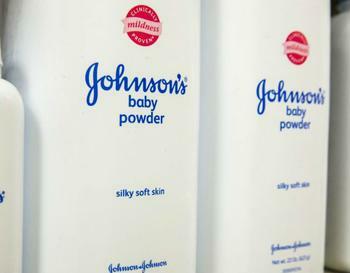 JOHNSON’S Baby Powder products contain only U.S. Pharmacopeia (USP) grade talc, which meets the highest quality, purity and compliance standards,” a statement on the company’s website reads. More than 6,600 talcum powder lawsuits have been filed against the company by female plaintiffs who were diagnosed with ovarian cancer following years of genital talc use. The New Jersey verdict is the first trial loss for J&J in a lawsuit over claims that talc products contain cancer-causing asbestos, Reuters reported.